The proposed technique extends conventional image morphing algorithms by offering additional control over the processing of the individual multi-resolutions that are used in the wavelet representation when moving from the source to the destination image. This gives the animator the possibility to introduce a disparity between the morphing of global and detail features that can lead to interesting new effects that are not achievable with traditional methods. The calculation of an intermediate image in conventional image morphing algorithms is done in three steps: firstly the determination of feature correspondence and of an intermediate feature geometry, secondly the warping of the source and the destination images to intermediate images that match the feature geometry, and finally the blending of the two warped images. The proposed algorithm alters the third step by making the blending dependent on the multi-resolution levels using a new specialized 2D wavelet transformation. The source image of the morphing is on the left side, the destination image on the right side. In the center we see two different morphing sequences. In the upper morphing sequence the details are morphed faster from the source to the destination and the global features are morphed slower. 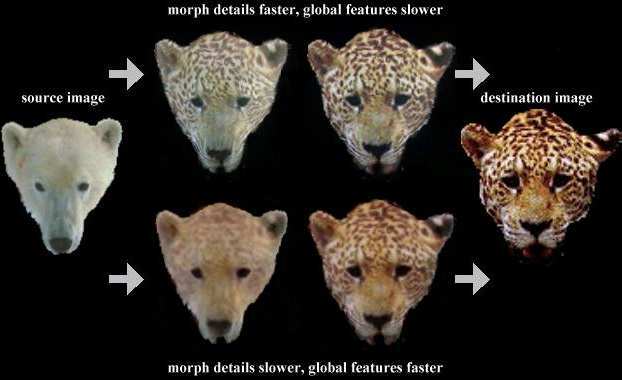 In the lower morphing sequence the details are morphed slower and the global features are morphed faster. If you are interested in the features of the program, look at the Online Manual. See the latest info for recent changes. This page is maintained by Manfred Kopp. It was last updated on March 23, 1998. If you have any comments, please send a message to kopp@cg.tuwien.ac.at.